(C) 2011. Leslie Wagner. LW-IP Consulting. 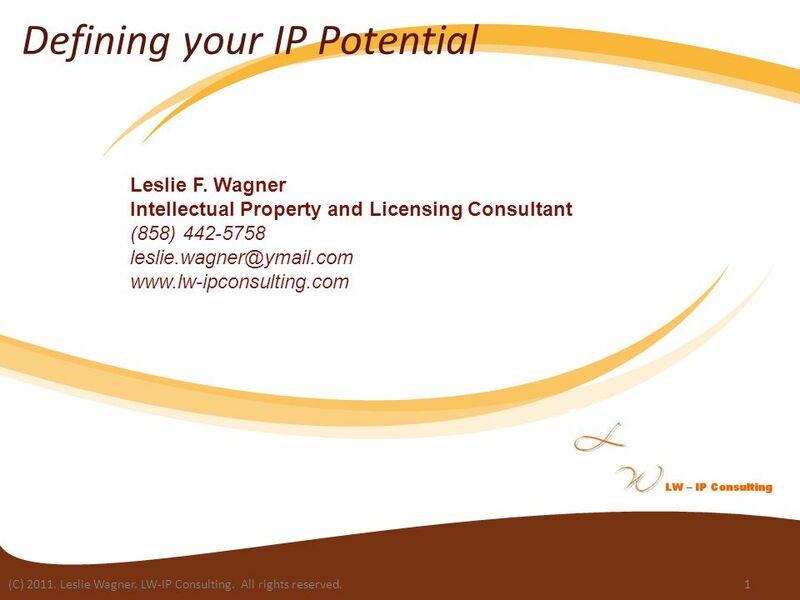 All rights reserved.1 Defining your IP Potential Leslie F. Wagner Intellectual Property and Licensing Consultant. 2 (C) 2011. Leslie Wagner. LW-IP Consulting. All rights reserved.2 The Total Package Intellectual Property (IP), licensing encompasses: Patents Utility (utilitarian/functional elements and features) Design (ornamental features) Plant patents (asexually reproduced). Copyrights documents, web sites, manuals, instructions, marketing materials, software, etc. Trademarks phrase, term, symbol, smell, sound, color, trade dress and product design that identify the source of the product (who not what). 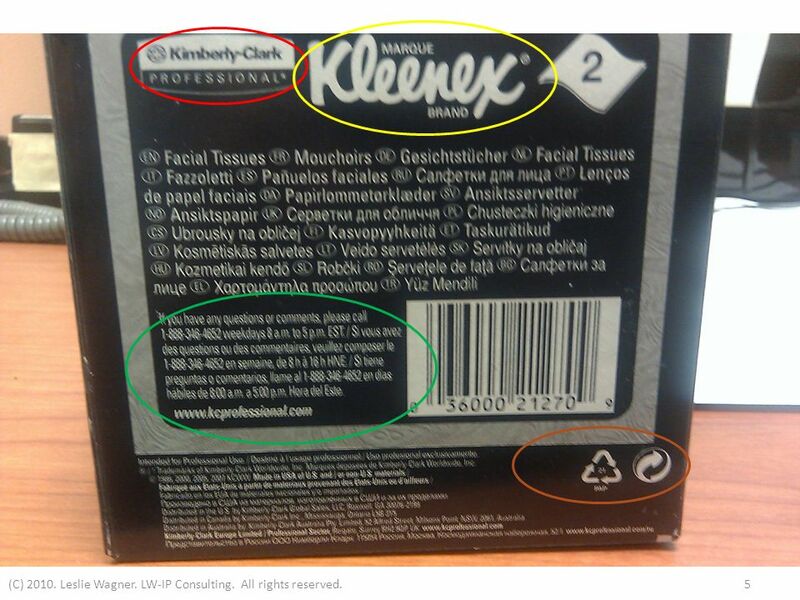 Trade Dress look and feel of the product packaging Trade Secrets unpublished information, processes, formulas, etc., that offer you a competitive advantage Create alignment in order to take advantage of your unique marketing opportunities. 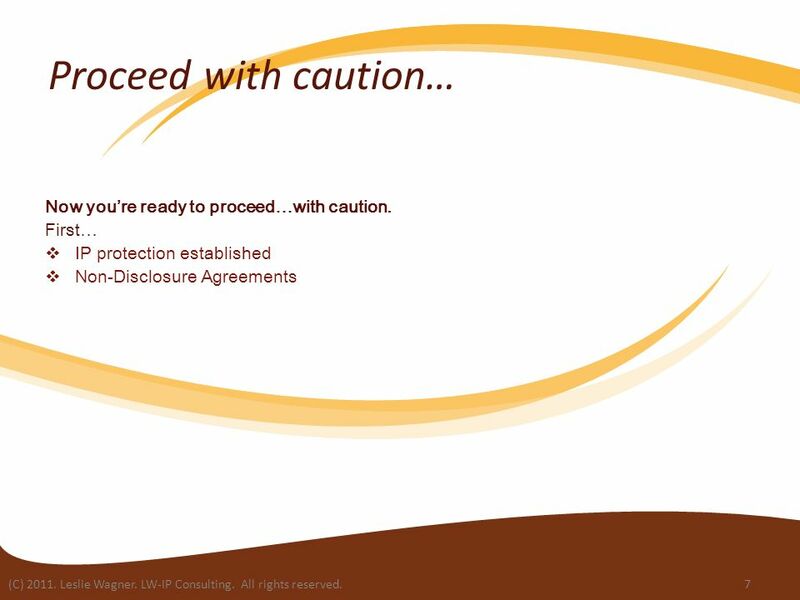 Effectively protect your entire IP portfolio. 3 (C) 2011. Leslie Wagner. LW-IP Consulting. All rights reserved.3 Work Backwards if you have to… Dont know your potential? what can I or should I license? who are my potential partners, distributors, licensees? 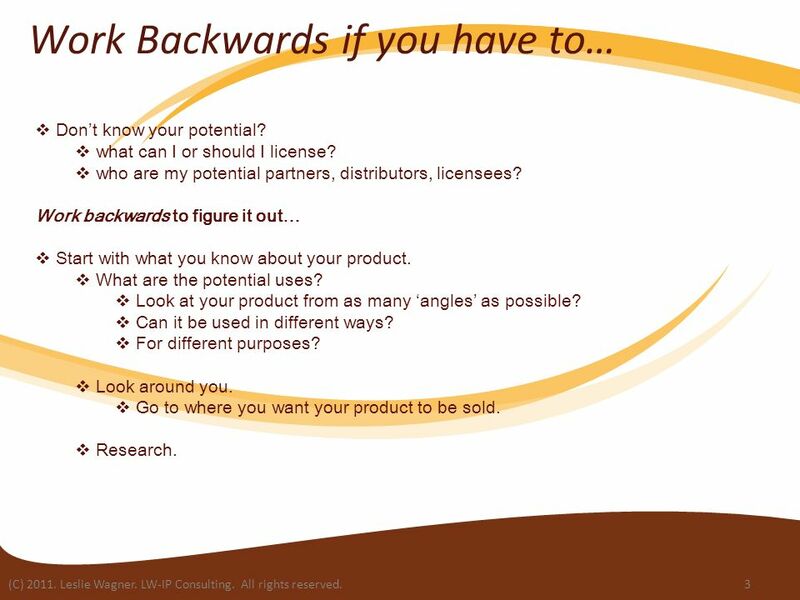 Work backwards to figure it out… Start with what you know about your product. What are the potential uses? Look at your product from as many angles as possible? Can it be used in different ways? For different purposes? Look around you. 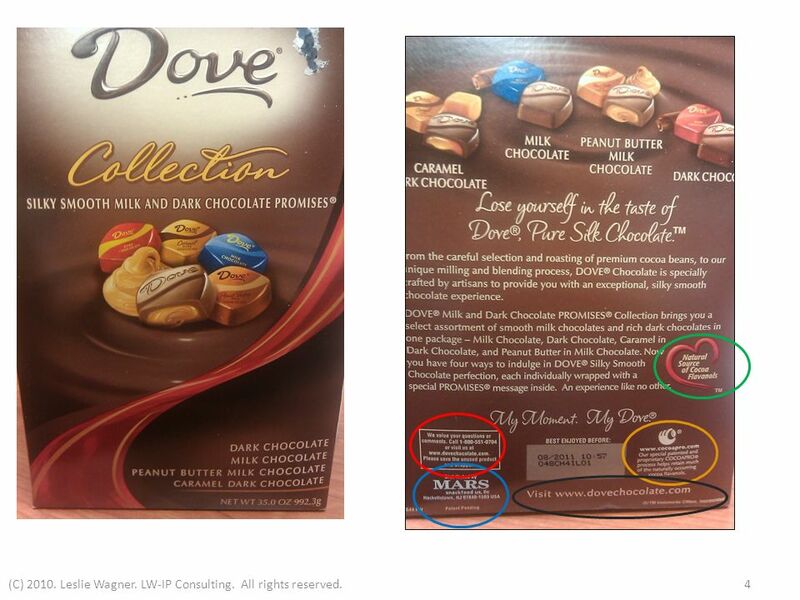 Go to where you want your product to be sold. Research. Download ppt "(C) 2011. Leslie Wagner. LW-IP Consulting. 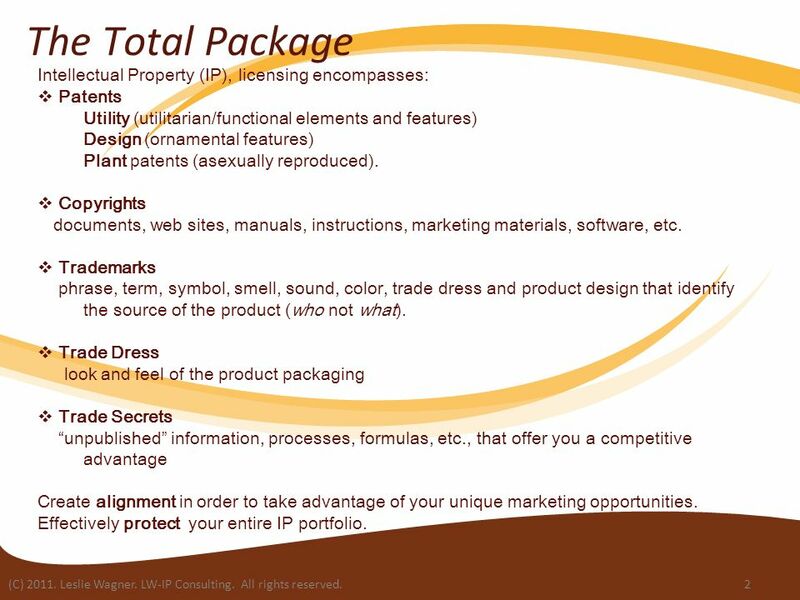 All rights reserved.1 Defining your IP Potential Leslie F. Wagner Intellectual Property and Licensing Consultant." (C) Leslie Wagner. 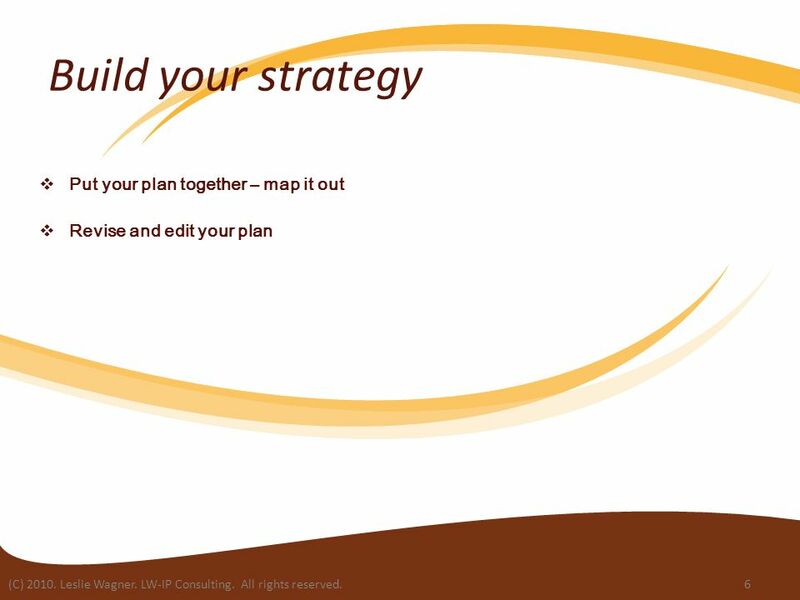 LW-IP Consulting. All rights reserved.1 Introduction to IP and Licensing Leslie F. Wagner Intellectual Property and Licensing. WIPO - TCCIA WORKSHOP ON INTELLECTUAL PROPERTY FOR BUSINESS FOR SMEs Dar-es-Salaam, Tanzania, May 10 and 11, 2005 Keeping Confidence: Trade Secrets in. Intellectual Property Issues in 3D Printing Presented at Rock Stars of 3D Printing IEEE Computer Society San Jose, California March 17, _1. Bullet Proof IP Perkins Coie LLP.  Full Service Firm slanted towards high tech companies  700 lawyers; 14 offices  Named one of the "Best 100 Companies"
Intellectual Property OBE 118 Fall 2004 Professor McKinsey Some property, very valuable property, exists only in our minds, in our imagination. It is intangible. P A R T P A R T Crimes & Torts Crimes Intentional Torts Negligence & Strict Liability Intellectual Property & Unfair Competition 2 McGraw-Hill/Irwin Business. Intellectual Property Review Objective 3.04 Understand intellectual property BB30 Business Law 3.04 Summer 2013. IP=Increased Profits How to Make Your IP Work For You Rachel Lerner COSE Fall 2006. K. Lance Anderson Of Counsel Greenberg Traurig, LLP “Innovate Lea County” Conference A Model for Innovation.